How romantic is this kiss ? Love is in the air. 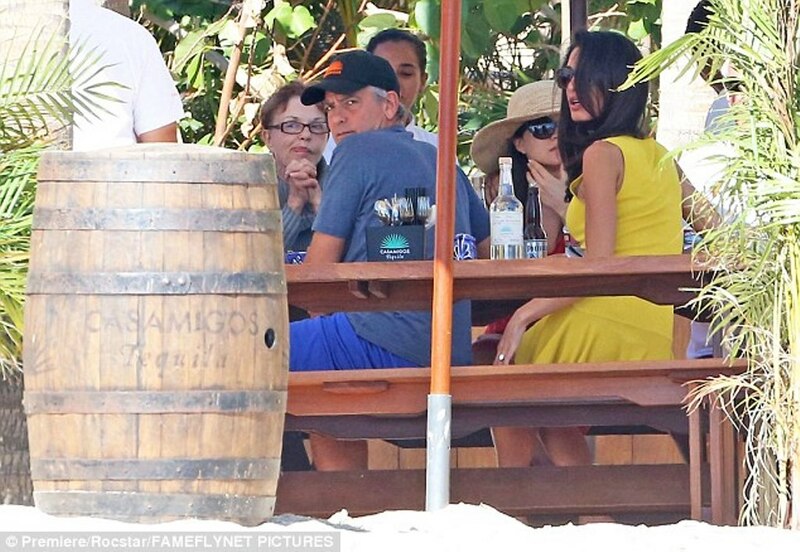 Amal and George Clooney have been spotted again in San Lucas. Vix Sofia by Vix Solid Yellow Joy Dress Cover-Up $26 ! And the cat-eyes sunglasses seem to be new. No ID with so blurry pictures. I don’t think amal has a stylist her family has said she has always been stylish. Women on vacation at the beach or lake dress the same way Maxis and hats . Anybody told him about they’re being photographed almost every day? I can’t understand why they continue going to that place. He always looks around trying to find the camera with a stern look on his face. I don’t think she has a stylist, either. Love the photos, looks as if they are having a great vacation. George reminds me of Cary Grant, so handsome! And she is just gorgeous! Oh mein Gott, wie langweilig, jeden Tag die selbe Kneipe und das soll schöner Urlaub sein?!?!?! I think the press are probably being annoying trying to get their attention, that is why George looks annoyed. But please !!! do they pose to advertises brand of tequila!!!! Embarrassing put the bottle in plain sight be hing them !! Pathetic !!! Beatiful Stacy !!!! Interesting observation about style similarities between Amal and Stacy. 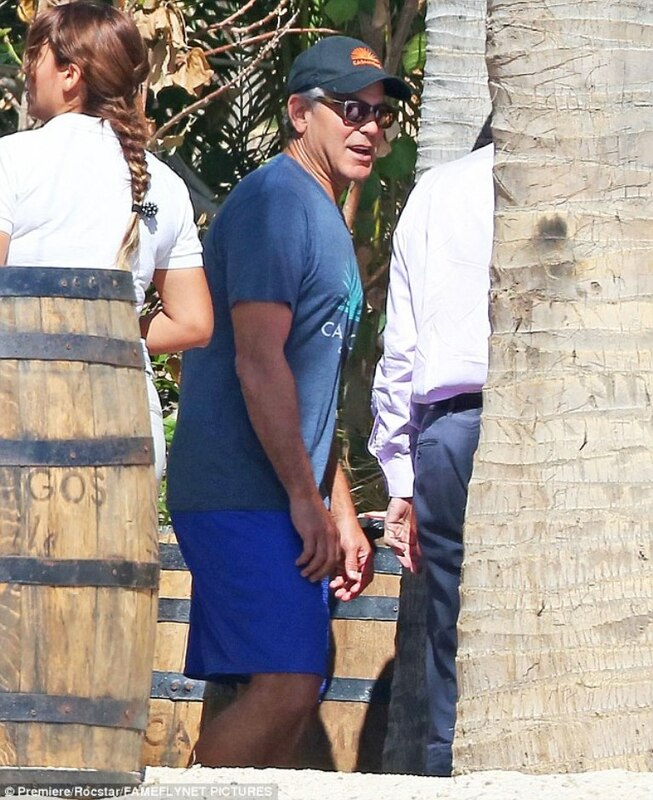 Although I do agree that most women at the beach tend to dress similarly, I think Amal does have a stylist or personal shopper who curates selections for her now, as her style has changed to favor more of the big name designers. Whether George influences her buying decisions is another matter, though. He probably does, at least a little, if by telling her when he likes the way that something looks on her, at the very least. George likely has a stylist, too. 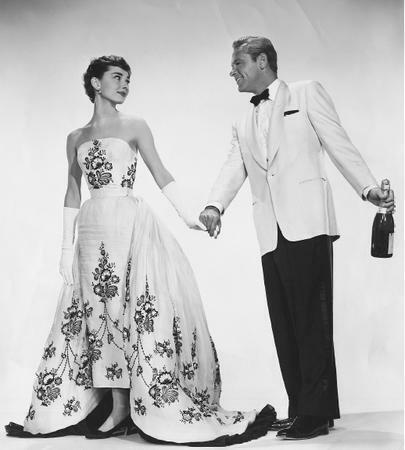 Most celebrities have stylists/personal shoppers who help out with wardrobe decisions and have connections to designers that wish to “advertise” their products through celebrity sightings. I do really like that blue maxidress on Stacy. I agree with the tought that she has some help, whether its a personal shopper or a stylist. As you guys said, she might have been stylish before, but you can tell that all of it was amatorial, and not even sooo chic or not that well arranged. I ve read somewhere that she was given a name of a hairdresser by Anne Wintour, and it was obvious that the same lady ( or her assistants) had arranged also Amal’s wedding outfits toghether with the impeccable make up, hair and style dynamics. If you think about it, every detail of her styling was almost perfect. I see Nina in the pictures, George’s Mom. Wonder if Mom Baria is there or any of Amal’s family with her over the holidays in Mexico. All celebrities have stylists and there is no exception for Amal. She has been stylish before but now she has a stylist who picks the dresses for her! Whenever I see old photos of Gergoe with different women in the past.. I feel so sorry for Amal.. And wonder how she deal with it. 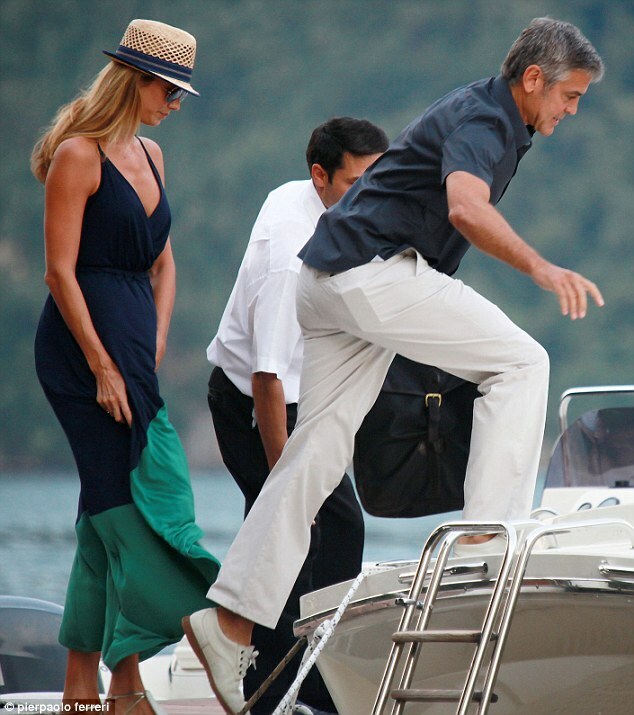 Like Stacy photo ridding the boat… Amal was photographed in the same position.. She will always be compared to the old girlfriends.. And maybe she will never measure up to their beauty or their fame. Although Amal is highly educated . Smart and accomplished.. But unfortunately for her.. That is being discounted and she will be just another women which geroge accessrized himself with. Amal is a beautiful and well-established woman. I am not interested in celebrity life in general, but there is something about Amal that keeps me intrigued. Think it’s her mix of smarts, being career-driven, and making a very public marriage work with such a background. 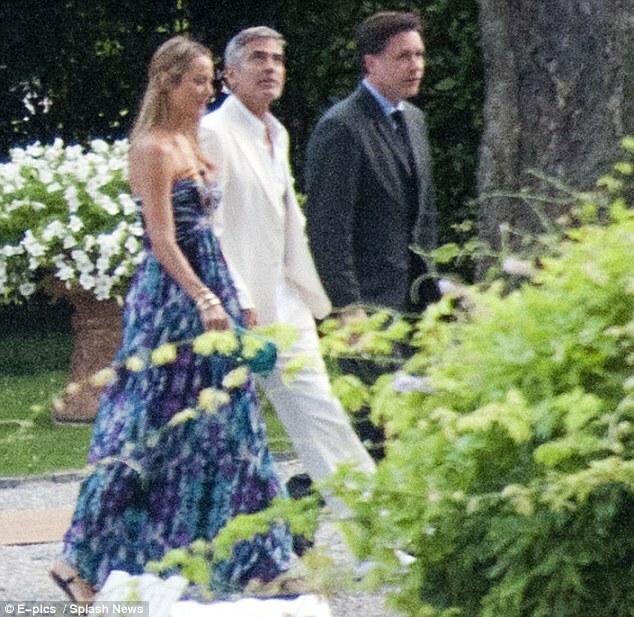 she has no competition with Clooney past….she is married to the guy….that says a lot….. I know that Armani will send George clothes when he needs them he is a friend. I don’t think George has a stylists he isn’t that into clothes , I think he knows what he likes he tends to wear the same things most of the time. George wears make up at some events, if you haven’t noticed. I’m pretty sure he has a stylist for more formal events. Look at his style when he’s off duty – jeans and a t-shirt. For instance, in some of his wedding photos, it looks as if he’s wearing a light coat of powder on his face, too keep the shine down. Either that, or he’s been airbrushed. But, stylistically, I’m sure that he gets some help. According to George she never uses a stylist. She picks her own dresses. Straight off a plane from #Sydney to a private cocktail party with #GeorgeClooney #CecilBDeMilleAward recipient at #GoldenGlobes on sunday. Life's tough:) George told me the mrs #AmalClooney will be wearing something very pretty on the #goldenglobes #redcarpet and she never uses a stylist. She picks her own dresses. Can't wait to see! I can’t reply directly to your comment, Nati, but it would be so cute if George really was monitoring your website. Hi, George! Glad you ditched the jeans, and apologies for calling you a peacock, earlier. 🙂 Nice wife, even if I do find some of her fashion choices of questionable taste. 🙂 After all, it’s not really the fashion that matters. I was married to two Taurus men – both on the same date. These guys are stubborn, cheap, unaffectionate after the first two years, selfish and just plain boring. They never allow you to really get to know them. Believe me it gets annoying. I give this couple five years. Amal is going to get bored with him and move on to someone more her equal. At first, I cringed at the thought of George Clooney marrying anyone. He just seemed to be such a horrible womanizer. Plus, the huge age difference between George and Amal, as well as the media circus surrounding the wedding, really made me wary about everything. However, I’m warming up to him… slowly. Some of his generosity seems to be showing through (I’m not talking about the flashy sort of “generosity” some public personalities have). I do wish he’d talk about MTR the same way that his fellow Kentuckian Ashley Judd does, and that he would be more vocal against US imperialism, even if he does buddy up to the current president. Perhaps he’s not really that progressive, though. I do like Amal and wish her well. Her boss seems to be a really good man, taking on more progressive cases, too. Taurus men are generous but that ends when they get bored 2-3 years into the relationship. Amal is a stunning women and obviously very bright. She has great style regardless if she has a stylist – she still has to say ‘yes’ to whatever outfit they want her to wear. She wears her clothes with confidence and that’s what style is all about. She wears the clothes. The clothes don’t wear her. The British accent and exotic looks also appeal to her overall style.